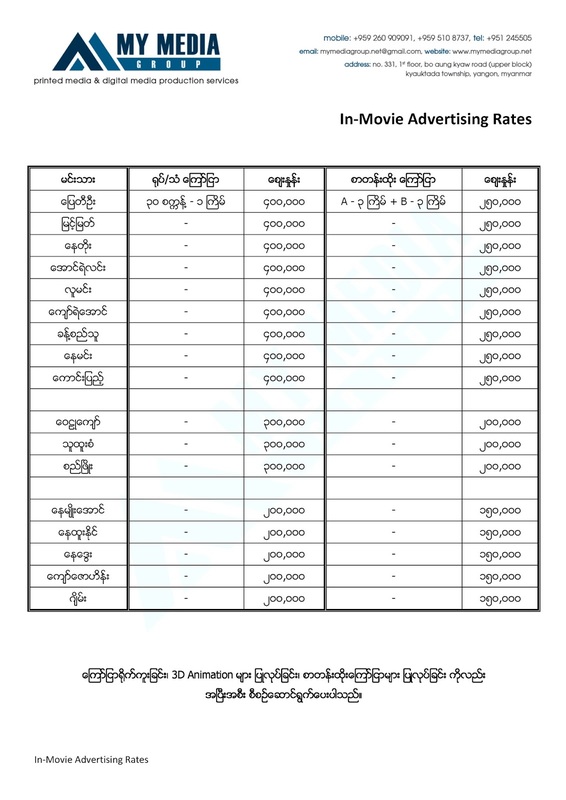 We can arrange to advertise your business in Myanmar Movies also. Your commercial (around 30 seconds) will appear once and your crawling advertisement (around 10 seconds) will appear 6 times (3 times on Disc-A and 3 times on Disc-B). Please click to see In-Movie Advertising Rates. We do for you 2D/3D Animated Commercial including Script Writing, Voice-overs, Audio Recording, Audio Dubbing and also Commercial Shooting including arrangement of Director, Actor & Actress, Singers, Composer, Music Band and Song Recording. The cost will depend on your choice and feel free to contact us for more information.